My earliest performances, in the late 70's, featured objects which were masks or costume extensions of my own body. Dresses and skirts of unusual materials--3,000 walnut shells, 90 lbs. of glass, dozens of fresh fish--became an integral part of my autobiographical performances. After a while, I felt alone onstage in these solo works, and I began to create small likenesses of myself to take oncertain supporting roles. These were my first puppets. Soon, there were so many "little Theodoras" onstage, that I was able to exit the performing arena and take over the director's role outside the frame. My works expanded out from autobiography, to consider large-scale subjects, such as the history of American invention, genetics, food and famine, and medicine. I have always felt that puppet figures have an innocence and a purity that make them especially effective in illuminating social and political issues. Those qualities, in addition to their ability to express deeply felt emotions to an audience, have led me to incorporate a wide variety of puppets into my performance and installation works for the past 20 years. Theodora Skipitares is a visual artist and theatre director, who has been creating her works for more than 25 years. Born in San Francisco of Greek parents, she moved to New York in 1970. 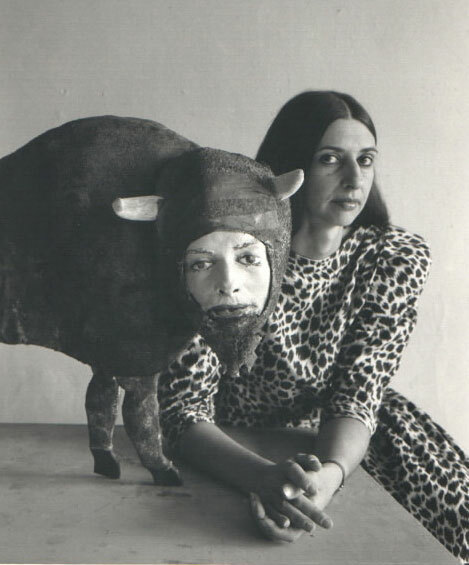 Trained as a sculptor and theater designer, she worked briefly as a designer for groups such as Richard Schechnerâ�™s THE PERFORMANCE GROUP, and Omar Shapliâ�™s SECTION TEN. She began creating personal solo performances in the mid 1970â�™s. Gradually, she moved away from autobiography, and began to examine social and historical themes. Realistic, life-size puppet figures, as well as miniature ones, became the â�œperformersâ� in large-scale works that included live music, film, video, and documentary texts. These works were often collaborations with prominent composers such as Virgil Moorefield, Bobby Previte, Scott Johnson, Pat Irwin, Barry Greenhut, David First, Tim Schellenbaum, Arnold Dreyblatt, and most recently, Sxip Shirey. These works included THE AGE OF INVENTION, an examination of 3 centuries of American invention featuring 300 puppets, DEFENDERS OF THE CODE, a history of eugenics, and THE RADIANT CITY, a music-theater work based on the life of Robert Moses. More recent projects include UNDER THE KNIFE, a site-specific story of medicine which took an audience to twelve different theater environments, and BODY OF CRIME, a history of women in prison. In 1998 she premiered A HARLOTâ�™S Progress, a chamber opera with life-size puppet figues based on the engraving series by William Hogarth; in 2001 she completed OPTIC FEVER, an exploration of Renaissance artists and their new way of seeing. She has received a UNIMA Citation for Excellence in Puppetry, a Guggenheim Fellowship, a Rockefeller Fellowship and a McKnight Playwriting Fellowship, among others. DEFENDERS OF THE CODE was named one of the 10 Best Plays by the New York Times in 1987. A HARLOTâ�™S PROGRESS is one of the urns-Mantle 10 Best Plays of the 1997-8 season. A HARLOTâ�™S PROGRESS is also the winner of an American Theater Wing Design Award. Her visual work has been exhibited widely in the U.S., Europe, and South America. In 1997, she traveled to Vietnam with Ellen Stewart (La MaMa Theater), here together they developed an opera with the National Theater and the Vietnamese National Water Puppet Theater. Also, in 1997, she directed and designed a production of Charles Ludlamâ�™s THE ENCHANTED PIG for Sundance Theater. In 1999 and 2000, Ms .Skipitares was in India as a Fulbright Fellow, where she worked with Indian puppeteers and choreographers to create two works. In 2002, she traveled to Cambodia and India to develop new projects. When the war in Iraq began, Ms. Skipitares returned to the ancient Greek playwrights for inspiration and created 3 works about the long and bloody Trojan War: HELEN, QUEEN OF SPARTA; ODYSSEY: THE HOMECOMING; and IPHIGENIA. The cycle, called TRILOGY, was completed in 2005. She continues to work with Greek themes and authors, especially Euripides.